This spring I’ve had the pleasure of teaching a group of adults who are planning a trip to Germany this fall. We started with a 90-minute tour of the Reformation last week and will conclude next Sunday with Dietrich Bonhoeffer, but for the middle of our three-Sunday course, they were kind enough to let me talk about Pietism. With its major airport, Frankfurt-am-Main is often a good starting point for visits to Germany. And it just so happens that it’s got a good claim to being the birthplace of Pietism! It was the city where a young Philipp Spener was appointed the chief Lutheran minister in 1666. The church where he served (the Barfüßerkirche) was replaced around the time of the French Revolution by the Paulskirche, itself the host of Germany’s 1848 attempt at a democratic revolution. (Destroyed by bombs in 1944, the post-WWII rebuilt version includes a Spener memorial plaque). A hotel and meeting center run by the local Protestant church is named after Spener. The city’s historic Saalhof was the meeting place of a conventicle led by, among others, Johanna Eleonora Petersen, which grew more radical than Spener and split off about the same time that he wrote the book that inspired The Pietist Option. And that building is right next to the city’s historical museum. Given the overwhelming influence of Martin Luther on German Pietism, I’d consider stops in Eisenach (Lutherhaus, the Wartburg Castle) and Erfurt. Not only is the latter the place where Luther became a monk and learned theology, but the great Pietist institution-builder August Hermann Francke also studied briefly at that university — and returned in 1690 to become a preacher as popular with the people as he was loathed by local authorities. But if we were going to stop in any Lutherstadt during our journey from Frankfurt to eastern Germany, it would be the reformer’s birthplace, Eisleben. Pietist forerunner Johann Arndt (called “a second Luther” by Luther biographer Heiko Oberman) served briefly there as the pastor of the Andreaskirche, just a short walk from Luther’s birth house. If I remember my chronology, that was about the time he finished True Christianity. 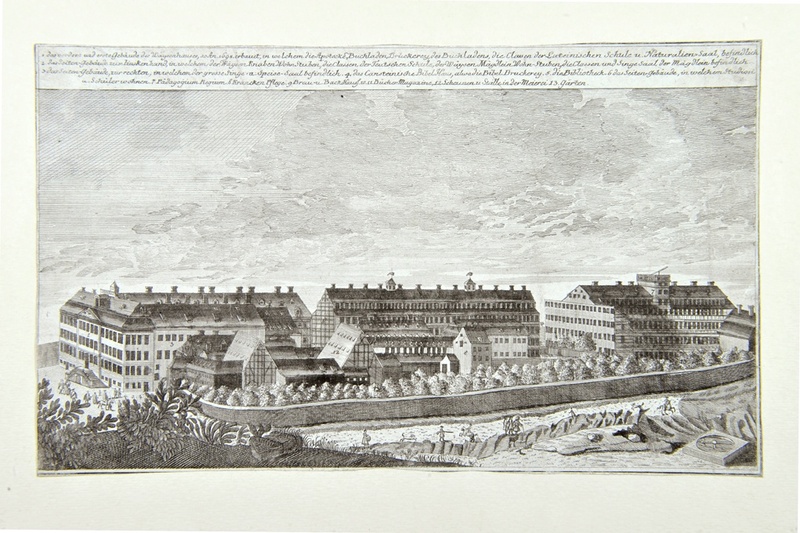 While both were struggling with opposition from political and religious authorities (see below, Leipzig and Dresden), Spener arranged in 1692 for Francke to teach at the new University of Halle, with a pastorate at St. George’s Church in the neighboring community of Glaucha to help pay the bills. In addition to the church and university (which absorbed the nearby university where Martin Luther began the Reformation after the Napoleonic Wars), you can visit the Francke Foundations that made Halle the institutional center of Pietism. Those interested in religious history can hardly visit this part of eastern Germany without spending time in Wittenberg, the center of Luther’s reformation. (Start at the Schlosskirche and walk in the direction of the museum occupying Luther’s home, stopping along the way at the homes of artist Lucas Cranach and theologian Philipp Melanchthon.) But there are Pietist connections here as well. Not only did churchly Pietists like Spener and Francke revere Luther, but the Radical Pietist scholar Gottfried Arnold graduated from Luther’s university, and later returned to Wittenberg to write his famous church history. Nikolaus von Zinzendorf studied in both Halle and Wittenberg, and it’s to his part of the story that we need to turn. But first, let’s pause in a couple of larger eastern German cities. The site of a major disputation in the early history of the Reformation, Leipzig was also the academic home of August Hermann Francke when he started a Bible study that became a local center for Pietism. But that made him anathema to Lutheran Orthodox members of the faculty; it was after he was banned from lecturing in Leipzig that Francke took refuge in Halle. But as long as we’re here… Leipzig is better known for its connections to Johann Sebastian Bach. Visit the Thomaskirche, Nikolaikirche, and Bach museum and debate the influence of Pietism on one of the greatest composers in the history of Christianity. For example, it seems that sermons by the Pietist preacher Heinrich Müller influenced Bach during the composition of his St. Matthew’s Passion. The village of Berthelsdorf still houses the Zinzendorf Schloss, but that estate is more famous for becoming the home of a group of religious refugees that became the Moravian Church under Zinzendorf’s leadership. In Herrnhut, the Moravian Kirchensaal is being reconstructed (presumably with an eye to the 300th anniversary of the original group coming to Zinzendorf’s estate, in 2022). Down the street is a museum housing artifacts sent back from around the world by Moravian missionaries, some as old as the 1730s. We conclude in the capital of Germany, where Spener ended his life as provost at the Nikolaikirche. (There’s a memorial plaque outside the church.) Both Spener and Francke cultivated connections to the Prussian monarchy, so perhaps plan a visit to the Berlin Palace (currently being reconstructed). Of course, I’d love to continue on to Scandinavia and visits sites related to those pietistic revivals in the late 18th and 19th centuries. Or if you’re a Blumhardt fan, perhaps you can talk my colleague Christians Collins Winn into taking you around Württemberg.